The Magician card sees you creating success in everything that you do. This is a Tarot card about reaching your goals by using the skills, tools and resources that are available to you. The Magician suggests that you will come up with creative ways to solve problems and you will be able to use your existing knowledge and to find solutions.The Magician Tarot card is a good omen when you have a specific wish, when you begin a project involving creativity. The Magician Tarot card indicates that you can benefit from your creative forces if you can claim your power and act with awareness and concentration. This card is a signal to act consciously and act now provided you understand exactly what you want and are committed to getting it. You need to know what you are doing and why you are doing it. Be clear about your motives and intentions. A new journey, one that will takes us past what we believe are our limits. The Fool represents the need to set forth on a new journey, one that is completely unknown and will take you to unknown places. The Fool is all about new experiences, personal growth, development and adventure. The Fool Tarot card asks you to take a leap of faith and to trust in the Universe in that if you begin a new journey, you will find success. This Fool lives a carefree life, free from worry and anxiety. The Fool does not seem to mind if he does not really know what lies ahead. This year I am going to post the way I Read My Tarot Cards. Last year I tried (unsuccessfully) to post a card of the day. The main reasons this was unsuccessful was because I kept forgetting what day it was, and I kept getting so worried that everything I said was going to sound stupid. That is also the reasons I never post anything anymore (sorry ’bout that). I worry too much about what others think, to the point that if I want to say something, I don’t. It’s starting to seriously hinder a lot in my life, because I don’t speak up for myself in any situation. Anyway, back to the point. 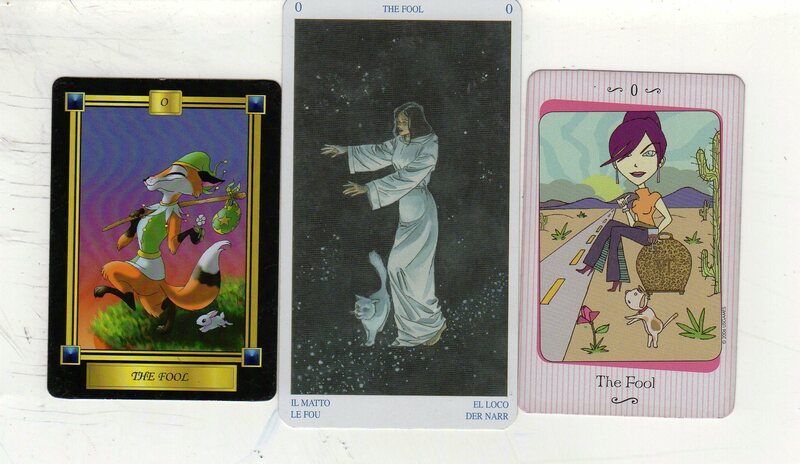 For this I will do the Major Arcana first, then I will go through each individual suit in the Minor Arcana. I’ll be posting this once a week for awhile, then twice a week for the final 20 something weeks at the end of the year. Th decks I’ll be using is the Vanessa Tarot by Lynyrd Narciso, The Fox Tarot by Mary Hoy, and the Pagan Tarot by Gina M. Pace. I’ll post a picture from each decks with each week. And finally, I’ll post more pictures of me and my life and post more personal stuff, so that this feels more like I’m a real person and not a robot. Unless otherwise specified, all content provided on this website belong to: Evangeline V Isabella-Lenore (c) 2017. All rights reserved. Interested In An Intuitive Reading?